The number of unemployed graduates exceeds 60,000 but the government doesn’t have any programme to generate jobs states Unemployed Graduates Union. This was stated by the convener of the Union Chandana Sooriyarachchi at a press conference held at the auditorium of the National Library in Colombo yesterday (8th). The government that came to power promising one million jobs would be created should be ashamed as it has failed to find employment even for the graduates pointed out JVP Parliamentarian Sunil Handunneththi who participated in the press conference. The ‘fast unto death’ by the parents of state university medical students and organized by the Medical Faculty Students’ Parents Association was called off yesterday (8th) night following talks with government representatives, including Deputy Minister Dr. Harsha de Silva. A spokesperson for the parents said that they had been able to steer their campaign to a successful end. The oil tanker ‘Neverska Lady’ with 40,000 MT of petrol from the United Arab Emirates arrived in Sri Lankan waters yesterday 8th). According to Petroleum Resource Development Ministry, the fuel quality will be checked as soon as the ship reaches the Muthurajawela oil refinery complex jetty and fuel pumping will start by 11 a.m. today when the oil quality report is received early in the morning. Petroleum Resource Development Ministry Secretary Upali Marasinghe has said that distribution of fuel brought by the ship will start by today noon. Marasinghe pointed out that the already available petrol stocks will be distributed across the country in the morning today. SAITM, the medical degree selling institute at Malabe would be abolished says the President of the committee regarding SAITM issue appointed by the President Dr. Harsha de Silva. He said this making a special statement in Parliament yesterday (8th) evening. 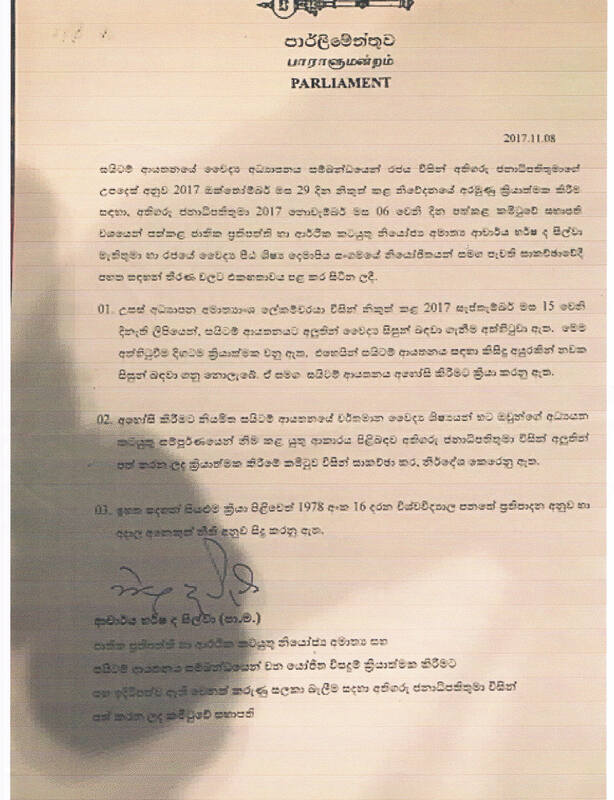 Admission of students to SAITM would be stopped and a decision would be taken by the committee appointed by the President regarding the students already admitted said Dr. Silva. Also, further action would be decided according to clause 16 of the University Act on 1978 states Dr. Silva in his letter.